For most, “eating disorders,” conjure up an image of a young and slender hand clenching her Diet Coke. Slimmed by years of extreme dieting or consumed with cyclic bouts of binging and purging, she is the result of the insecurity, low self-esteem and lack of control we associate with being an adolescent. But new research shows that an increasing number of sufferers of eating disorders are aged in their 30s, 40s and 50s – women struggling with the emotional aftershock of changing bodies and altered lifestyles. In her latest book, Midlife Eating Disorders, US psychiatrist Cynthia Bulik, has thrown down the proverbial gauntlet, imploring us to stop thinking of eating disorders as a high-school illness. For many women, midlife can mean an unenviable cocktail of emotional upheaval. From the nerve-wracking task of raising teens to the pressure to compete with a slew of young upstarts in the workplace, women may endure shifts in their emotional and personal landscapes leaving them with lowered feelings of self-worth and hopelessness. According to Bulik, divorce, infidelity, and an empty nest are just some of life’s twists and turns leading some to the refrigerator door. It’s a familiar story for psychologist, Annabelle Ryburn of Eating Disorders Victoria. But it’s not all tears and adultery. Professor Susan Paxton of La Trobe University says the combination of our increasing waist band with our social fixation on youth and thinness comes into play, too. “One factor appears to be the increasing size of the Australian population but no commensurate change in the size of the body image ideal… more people are using more extreme (and typically counter-productive) ways of trying to combat this pressure,” said Professor Paxton. But while we may think of eating disorders as a pathological drive for thinness, for people in midlife, the most common eating disorder is binge eating (BED). Only officially added to the American Psychiatric Association Diagnostic and Statistical Manual (currently used to diagnose eating disorders in Australia) in 2012, BED now accounts for the majority of cases of eating disorders amongst Australian men and women. For Ryburn, the reported increase in diagnoses of midlife eating disorders may correlate to an increased awareness in both GPs and sufferers around the symptoms characterising BED. Additionally, says Paxton, more knowledge about eating disorders in general is likely to result in an increase in diagnosable symptoms. Paxton’s research found women who were able to accept their bodies as they aged were less likely to link self-worth with their appearance. These women were more likely to focus on “self-care,” such as making time to go for a jog or catch-up with friends. Such findings have been helpful for Paxton and her colleagues, whose group intervention for women suffering from midlife eating disorders was met with considerable success. Using Cognitive Behaviour Therapy (CBT) to address the risk factors of eating disorders in midlife, a group of 61 women were shown how to value their internal self-worth as opposed to focusing on their physical traits. The therapy saw women become more content with their own body image partnered with significant drops in the rates of disordered eating. The first problem to overcome says Paxton, is that women over 35 often have hectic schedules creating less time for nutritious habits or relaxation. The result is a higher number on the scale and less time to put in place lifestyle measures aimed towards maintaining a healthy weight. For clinical psychologist Lissa Johnson of Sydney, it seems that many women with BED will start a binge in the hope of experiencing some of the positive feelings they feel are lacking from their lives. It seems likely that women who base their self-worth on their successes at work, at home, and within their relationships are less likely to be at risk of resorting to dangerous dieting or overeating. Therapy, says Johnson, thus needs to be tailored towards treating the causes, rather than the symptoms, of the eating disorder. The good news for women who may be suffering is that Paxton’s work demonstrates those already at risk can learn to renavigate their thinking. While biology will eventually take its toll, it is important for all women to remember that we are more than just the sum of our physical parts. For more information contact the Eating Disorders Victoria Helpline number 1300 550 236 or visit the website www.eatingdisorders.org.au. 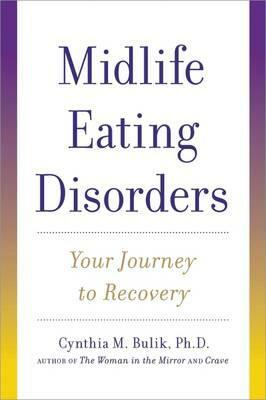 Cynthia Bulik’s book “Midlife Eating Disorders: Your Journey to Recovery” is available online and in bookstores.